I finally finished organizing our CD's! Up until a couple of weeks ago I had 4 boxes of CD's still sitting in a corner of the basement, waiting to be put away, more than a year after we had moved in. I know that a lot of people have gotten rid of their CD's and switched all their music to digital, but we aren't ready to let go of the excellent collection we have accumulated over the years. I like the tangible - being able to hold the disc in my hand and peruse the booklet art and lyrics sheets. There are few storage options for large collections, so I'm quick to jump on anything that looks like it would work for us. I saw this idea on another blog and stole it shamelessly. First we purchased the Hopen dresser from Ikea. We were able to use 4 drawers for DVD's and video games, as well as one drawer for remotes, controllers & gaming system hardware. Then we ordered JewelSleeves for the CD's themselves. 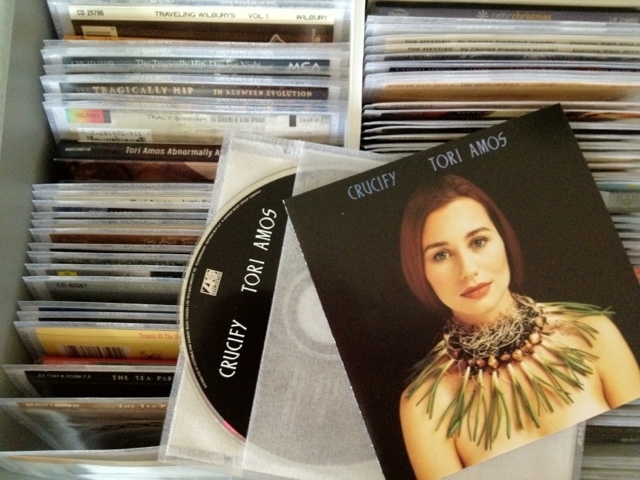 It took me about 4 evenings to transfer all the CD's into their new sleeves. It is a bit of a complicated process if you want to order from Canada, but it was worth it in the end. Each sleeve is made of a durable, heavy duty vinyl that includes three pockets, one for the rear tray card, a pocket for the front cover booklet and a centre fabric pocket for the CD itself. I left the CD's with specialty cases or double discs as-is, but transferred the rest. 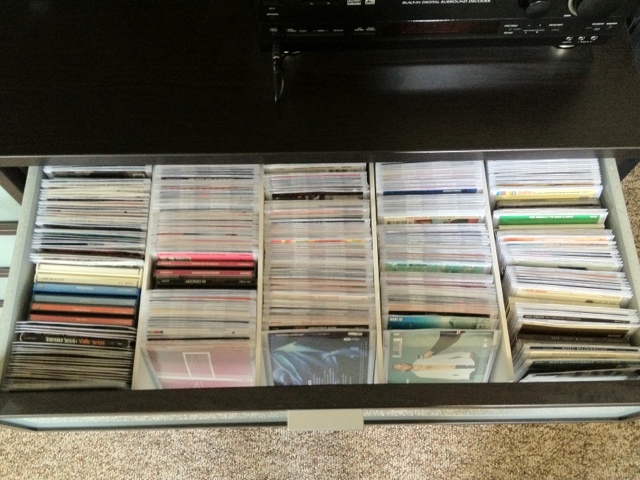 The one drawback to the Hopen is that the drawers don't open all the way, so to make up for that I used 5" square foam blocks from Michaels in the back to keep the CD's forward and from falling down, and then had my hubby cut foam core board to fit between each of the rows. This one drawer is holding over 400 discs. I love that I no longer have to dust hundreds of CD's and that kids can't grab them by the handful and wreck my alphabetized system! WOW!!! A lot of work, but definitely well worth it!! I/we haven't gone digital either!! I like your system. :) I may have to 'steal' it some day too!! Good job. Holy nice! It looks so good! 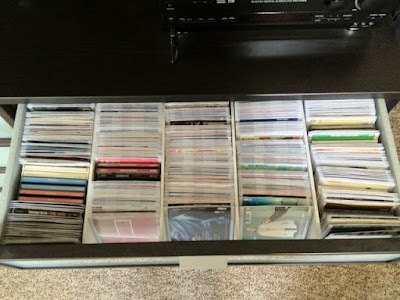 Did you have to reinforce the bottoms of the drawers to prevent sagging from the weight of the CDs? If so, what did you do? Thanks! No, surprisingly the drawers seem to hold the weight quite well. We may find that with time the weight causes them to sag, and then we will look at reinforcing them, but for now they are fine. This looks great! Are you still using this system? If so, how are the drawers holding up to the weight? Also were you able to store two rows of DVDs in each drawer even though they do not fully pull out? Yes, we are still using this storage system and the drawers are doing great, no sign of bowing or any strain on the drawers at all. 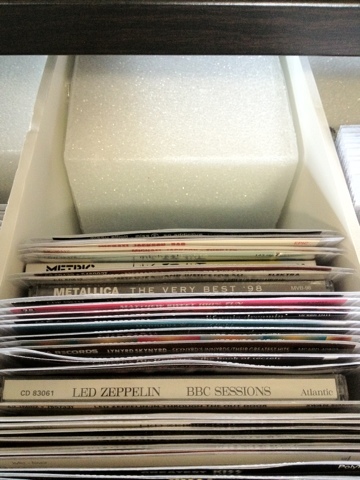 We ran the discs front to back, so there are 5 short rows in each drawer. Since the drawers don't pull all the way out, I put a 4x4 square foam block at the back of each row so the discs don't extend back into the drawer further than it pulls out, if that makes sense.